A sandwich with thick layers of various fillings is probably one of the best things in life. It’s satisfying and filling, making it a great snack for when you don’t have a lot of free time to cook a decent meal. 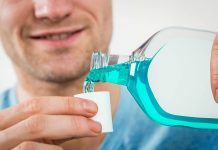 Unfortunately, it can be tricky to make since you have to ensure that all elements combine together without creating a huge mess. That’s why sandwich makers exist. 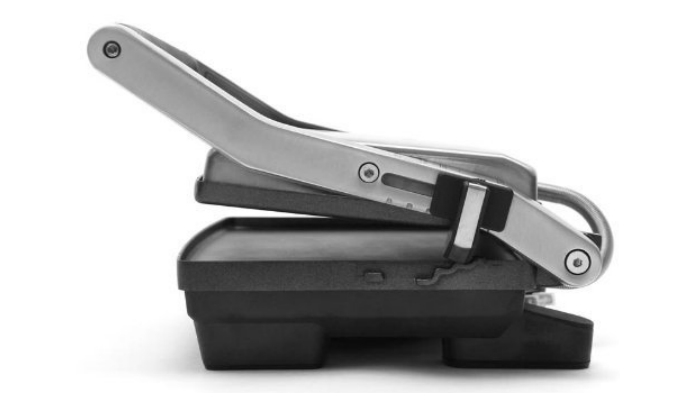 A sandwich maker is used for cooking different types of sandwiches. It is better than wide frying pans or skillets and complex ovens when it comes to simple sandwich-making because you do not have to preheat it anymore and closely monitor its progress. It is fully automatic from start to finish. After careful research and product testing, we are giving the best sandwich maker in today’s market. 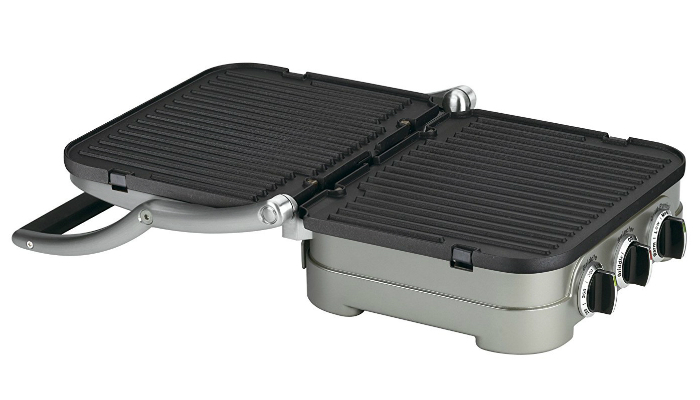 Cuisinart GR-4N 5-in-1 Griddler is clearly a multipurpose kitchen countertop appliance. 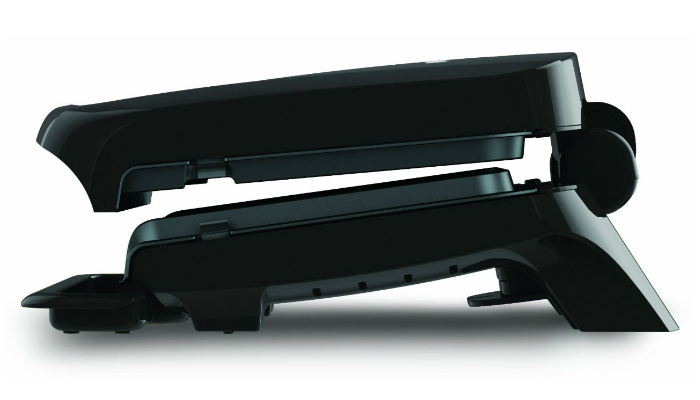 It has five uses: half griddle or half grill, full griddle, full grill, panini press, and contact grill. It can easily adjust to the thickness of a particular sandwich because of its floating cover. 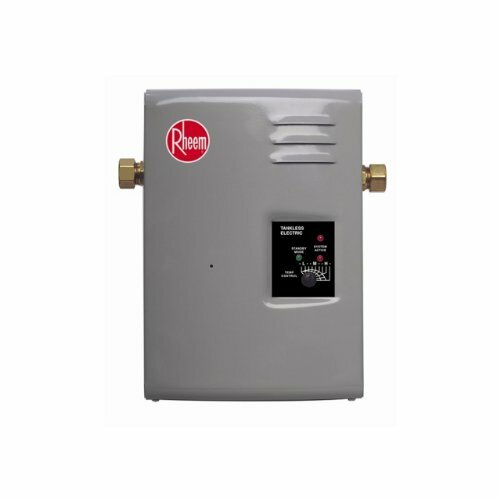 Its housing is made of brushed stainless steel for durability and sturdiness. The handle is reliable for careful pressing and lifting. Aside from making delicious sandwiches, this product also ensures that all of its finished products are healthy. How? Its cooking plates can be removed to drain grease. 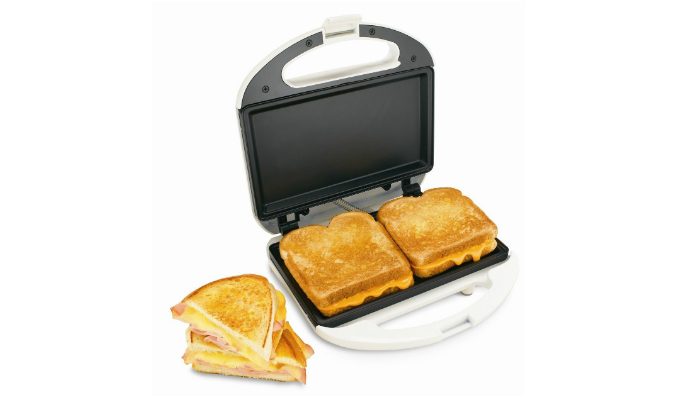 This sandwich maker promotes hassle-free toasting with its temperature controls, indicator lights, scraping tool, and free gourmet recipes. For other multipurpose kitchen appliances, check out our take on the best yogurt makers and rice cookers. 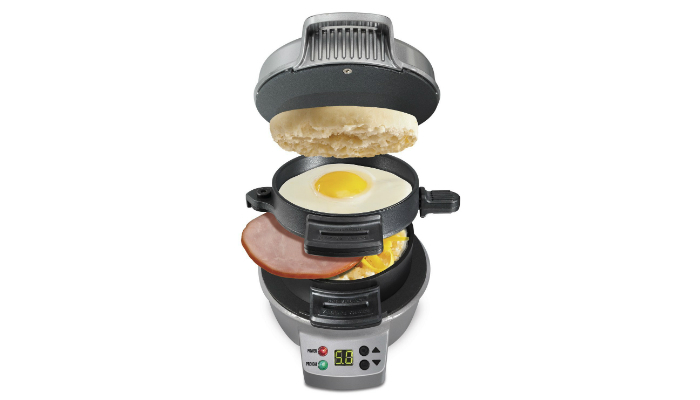 Hamilton Beach 25478 Breakfast Sandwich Maker has a timer so you can do other tasks while waiting. Its tone timer has the right level of loudness, enough for the whole kitchen to hear. More importantly, this sandwich maker does not simply press bread and filling together. 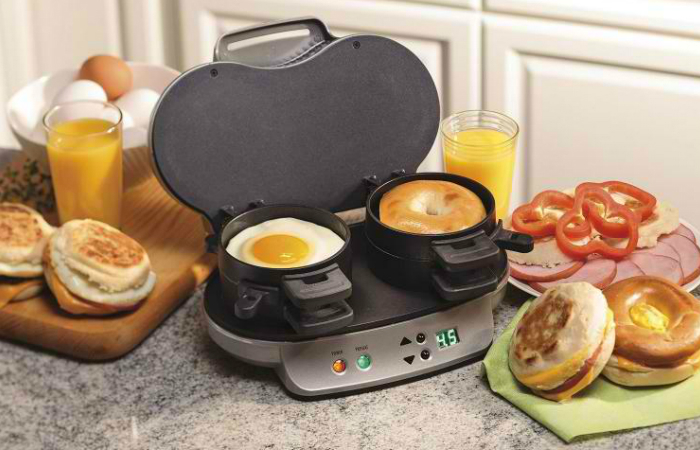 It can cook all components of a typical breakfast sandwich at the same time, approximately in just five minutes. Eggs, ham, cheese – you name it! Meanwhile, the bread sections focus on pure warmth. They can hold small bagels, biscuits, and English muffins. Lastly, every layer of this product can be removed for cleaning. It is nonstick for manual cleaning and dishwasher-safe for a much easier time. Breville BSG520XL 1500-Watt Nonstick Panini Press has QuanTanium cooking surfaces that are resistant to scratches for longer use. Its bottom plate toasts sandwiches evenly for tastier bites. On the other hand, the top plate gives grill marks for more mouthwatering sandwiches. George Foreman GRP1060B 4-Serving Removable Plate Grill and Panini Press is perfect for families because of its serving size. Aside from sandwiches, it can also make delicious burgers, cook chicken, and grill veggies. Its newly improved George Tough coating is nonstick and eliminates excess oil. 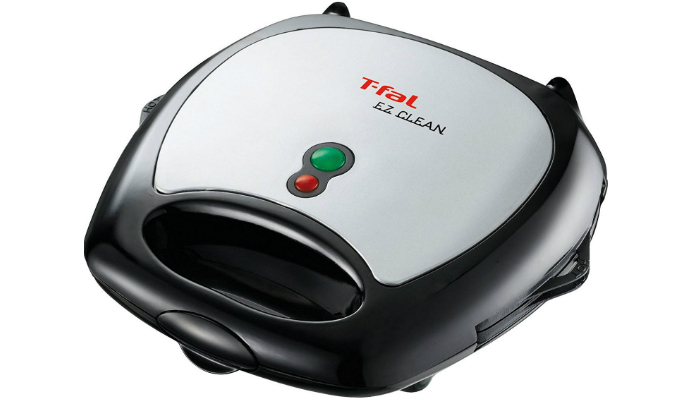 T-fal Easy to Clean Nonstick Waffle and Sandwich Maker has two sets of plates for hearty pocket sandwiches and square Belgian waffles. You can also make grilled cheese sandwiches with this product. It does not matter if you put a lot of filling for each sandwich; this kitchen appliance makes sure that the outcome will not be too messy. If you prefer an actual appliance meant for making waffles, find out the most ideal Belgian waffle makers. Proctor-Silex Sandwich Maker makes simple sandwiches with its flat grids. Storing this sandwich maker is a breeze as well. The form is compact and sturdy, perfect for upright storage. Overall, people who prefer the classic type of sandwich will surely like this product. It is a no-brainer that the market nowadays is packed with a wide selection of sandwich makers because of the demand. People are just getting busier and hungrier. There are two major types of sandwich makers. The first type is the panini press. It can be used as a toaster. It also has top and bottom plates. You have to close it to successfully heat up the entire sandwich. 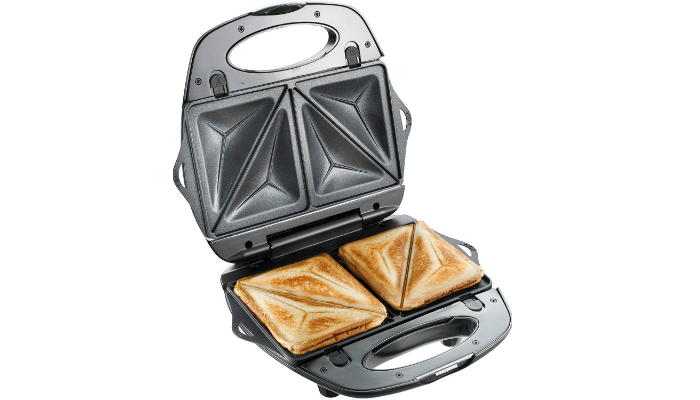 On the other hand, the second type is the four-triangle sandwich maker. It has four square plates that look triangular from the outside. It is great for making grilled cheese sandwiches. Before buying a sandwich maker, you must consider the size of the unit. 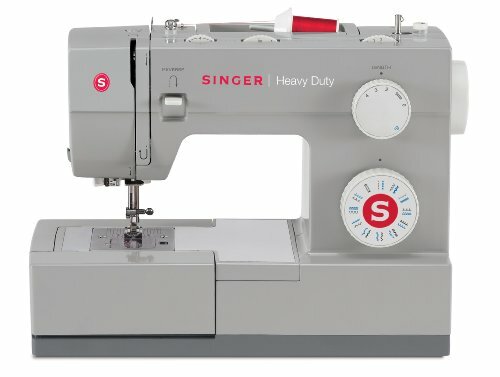 Choose the appropriate size based on your needs. Big sandwich makers are best for families composed of three to five members. However, if you are living alone, buy a small one so you can save money. Cheap sandwich makers are usually made of cast iron. They are not ideal for sticky sandwiches. You may choose one from products that have Teflon surfaces for easier cooking and cleaning. Nonstick kitchenware lasts longer than others. Meanwhile, other sandwich makers also have removable grill plates. This feature allows you to clean the plates thoroughly since they are separated from the unit. Check the handle of a sandwich maker before buying it. Steel is obviously much better than plastic. Plastic handles tend to break easily after frequent use. Most sandwich makers use lights as indicators. This feature makes it possible for you to multitask while cooking the sandwiches. The key to multitasking while making a sandwich is the timer. It helps you during busy mornings since you do not have to closely monitor the sandwich. Buy a sandwich maker of high quality that can also save you money. Sadly, that can be hard to find in stores. So, it is best to invest in a pricey yet excellent unit because cheap sandwich makers are risky to use. Cheap units usually break easily and do not make the most delicious sandwiches. We selected Cuisinart GR-4N 5-in-1 Griddler as our top product because of its versatility, durability, sturdiness, convenient temperature controls, and reliable indicator lights. In choosing the best sandwich maker for your kitchen needs, you must consider the product’s type, size, surface material, price, and additional features such as a handle, light indicators, and timer. On the other hand, you may also check out our take on the best ice cream maker, best potato chips and best cookie cutters! And if you want to do more with your sandwich maker, you can read our guide on how to make waffles using the appliance.